We have been having phenomenally warm weather this March in Wisconsin, with daytime temperatures in the 80s all last week. One day recently, we harvested perfectly rip sweet corn grown in our aquaponic systems and, that evening, grilled it with our dinner. As I lit the grill, anxiously awaiting that first bite of corn, I was thinking of all of the amazing foods we have grown in our commercial aquaponic greenhouses over the years. Way back in the mid 1990’s when we were still living in Mariposa, California, I recall harvesting largemouth bass, perfect tomatoes and fragrant basil, beautiful lettuce and crunchy green beans grown in our aquaponics greenhouse in February. The fresh fish and flavorful vegetables were one of our first complete aquaponically-grown meals and I will never forget the impact it had on us as we reveled in the idea that aquaponics could become a dominant part of agriculture, one which would provide fresh, safe food to people around the world. Thinking about that meal led John and I to a discussion of the amazing collection of photos from the past 25 years that we have of the crops we’ve grown and the grocery stores and farm markets where our crops were sold, the many greenhouses we’ve built and systems we’ve designed and installed, the many people who have participated in our training programs and that we’ve directly introduced aquaponics to at conferences around the world. And, we realized that we have a perfect platform to share that, our website. So, in the coming month, I will be adding a pictorial history of our experience and company to our website. It will be a fun and fascinating project to put together that will inspire many fond memories. The funny thing is, we have been growing aquaponically as commercial farmers and educators for so long that the first half of our career is before digital photography. So, my plan for assembling a pictorial history will involve looking through actual photographs and scanning them to show the time period from the mid 1980’s – 2000. And, after that, it is all digital. Another realization from this discussion is that the experience of our competitors dates back to the last decade (some less). Our experience dates back to the last century. We look forward to continuing to share this experience to help growers get started and be successful in aquaponics. It is this network of success that we are building that is bringing aquaponics to the forefront, and to become the vision that we had in the 1990’s sitting on our deck in Mariposa, eating our first aquaponically-grown meal. State Representative Joan Ballweg toured Nelson and Pade, Inc.’s greenhouse, office and manufacturing in mid-December. 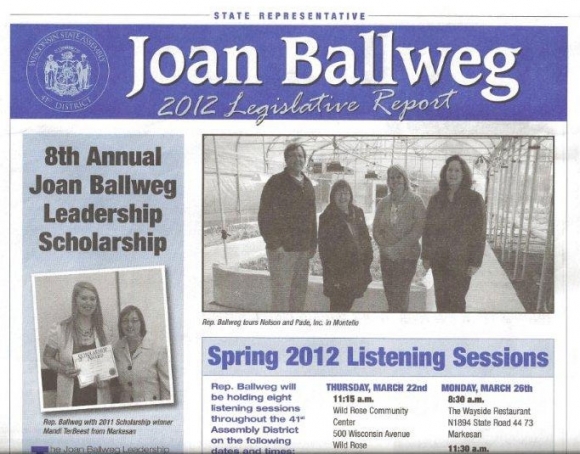 The visit was featured in the WI State Representative 2012 Legislative Report.